I'm not convinced that we craft credible profit and loss statements anymore. We need to outline the tolls that the marketing department pays to various vendors for access to customers. We need for our Finance teams, and for all employees in general, to understand just how costly it is to gain access to customers. 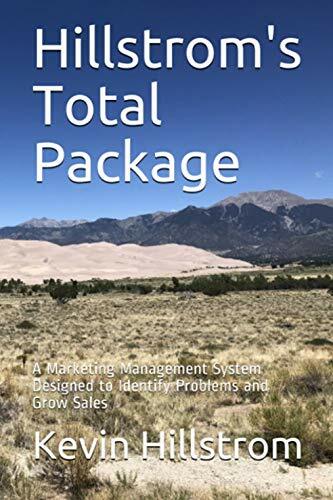 Now, many folks will point to the "ad-to-sales" ratio, and old-school metric, as the window into the tolls that marketers pay to access customers. That's fine. But we can do better. Look at this profit and loss statement. This is a moderately healthy business. 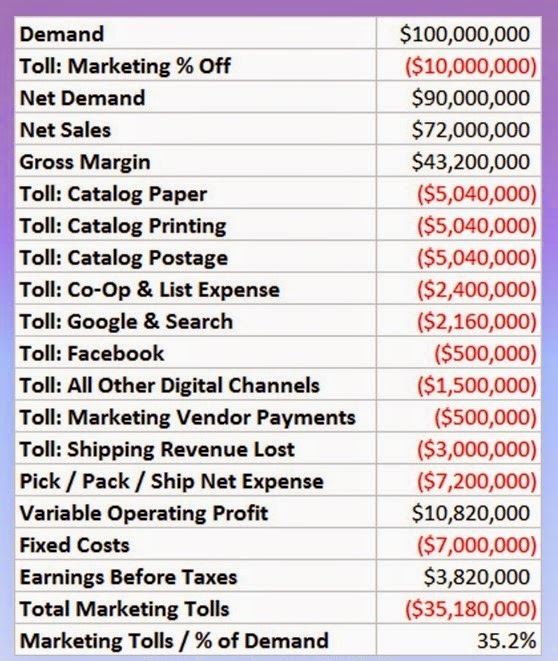 But look at the tolls that need to be paid, in order for this business to function. My goodness. My, my goodness. We lose ten million dollars in percentage off promotions. That's a toll we pay to get the customer to purchase. We lose more than fifteen million dollars in tolls paid to paper reps, the USPS, and to your printer. Without these tolls, catalogs don't go out in the mail. We pay more than two million dollars in tolls to the co-ops. We pay more than two million dollars in tolls to Google and Bing. We pay a half million dollars in tolls to Facebook. 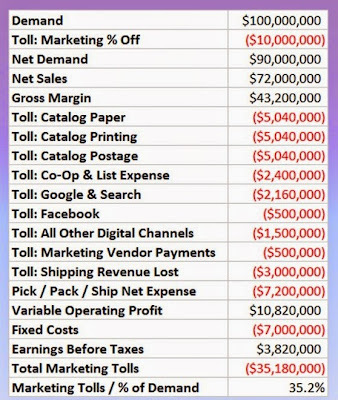 We pay more than a million dollars in tolls to retargeters and affiliates and other digital vendors. We pay a half-million dollars in tolls to other marketing vendors. We pay a three million dollar toll to offer free shipping to a subset of customers. In total, this business pays more than thirty-five million dollars of tolls. Those tolls generate $3.8 million in earnings before taxes. We should create a new metric, don't you think? We should create a toll-to-variable profit ratio (before fixed costs). This company generates $10,820,000 variable profit. This company pays $35,180,000 in tolls. In other words, this company pays $3.25 in tolls to generate $1.00 of variable profit. The toll-to-profit ratio is 3.25 to 1. The best companies have a very low toll-to-profit ratio. In fact, their toll-to-profit ratio tends to be 1.00 to 1 or lower. 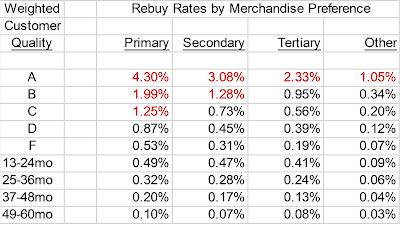 A company like Nordstrom, when I left in 2007, would have had a ratio of 0.15 to 1. Let that one sink in for a moment. The most helpless companies pay a very high toll-to-profit ratio. What is your toll-to-profit ratio? Have your CFO create the metric for you. Look at your profit and loss statement in this light. Make sure you factor in discounts, promotions, giveaways, and free shipping. Then prepare to be shocked. Is it any wonder the vendor community wants you to be "omnichannel"? The more omnichannel your business becomes, the more you pay in tolls.